Like a signature of an artist's painting, the backstamp on English china is the symbol of pride in workmanship. The difference is that the stamp is placed on the china before the piece is finished, so that it appears under the glaze. 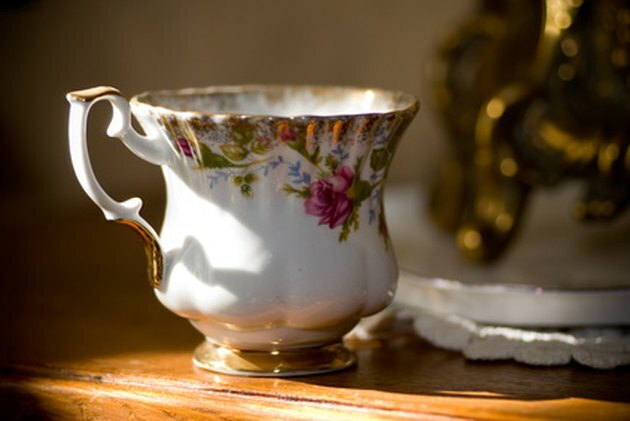 English bone china is revered as among the world's finest. Some porcelain pieces have more than one stamp on the underside, indicating the name of the company that manufactured it and the decorator of the piece. Other markings might indicate where the piece was manufactured or the retailer for whom the piece was made. Knowing the specifics of several well-known manufacturers makes it easy to figure out the origin of the china. English china sometimes has more than one mark. Look for the word "Doulton" backstamped on the underside of a piece. Royal Doulton has used many stamps in its nearly 2-century history, but every piece of Royal Doulton china has the word on it. Also look for the words "Lambeth" and "Watts," which indicate partners of Royal Doulton. In the early 19th century, those words appeared on many pieces of china. "England" began being stamped on each piece as of the late 19th century for export purposes. A Royal Doulton stamp with a line through it indicates that this is a factory second. Search for the word "Wedgewood" in the backstamp of the piece; all authentic Wedgewood pieces have it. Variations of the stamp occurred over time. Look for the oldest stamp mark, which depicts a pottery jug and the name "Wedgewood"; after the late 1800s, the words "Made in England" were added. Check marks on English china that have been stamped with the Shelley name. Many of the designs of the pieces were submitted to the Patents Office and were given a registered number. The numbers are usually preceded by the letters "Rd" followed by a 4-, 5- or 6-digit number. Look for an elaborate "W" for Henry Wileman on china that may have been produced between 1850 through 1910, before Shelley potteries merged with Wileman. All china with "Shelley" backstamped also has the word "England" printed somewhere in its backstamp. Examine the Shelley piece for a circled "2" stamped separately on the underside, indicating a factory second. Notice the color of the backstamp. During the first years of production of English china, only cobalt blue and iron red colors could withstand firing heat, so both were popular. Early Royal Worcester backstamps are red. Royal Worcester backstamps have changed slightly through the years, but all have a circle with four connected script "W"s inside the circle.